This year, I finally had the time to knit Gregory his own Christmas/Holiday stocking. His first Christmas, he was six months old, and I was still in a newborn daze. His second Christmas, we had just moved, and the last thing on my mind was extensive knitting. Now, on his third Christmas, life has settled into a busy, but predictable, pace. Gregory is finally starting to understand the idea of gifts and giving. We finally have a fireplace, a proper place to display these hand knits. It feels right that he should now have a stocking as special as mommy’s and daddy’s, for his own stocking stuffers. Bonus: I actually finished Gregory’s stocking before the Holidays, which I can’t say about my own and my husband’s stockings ;). 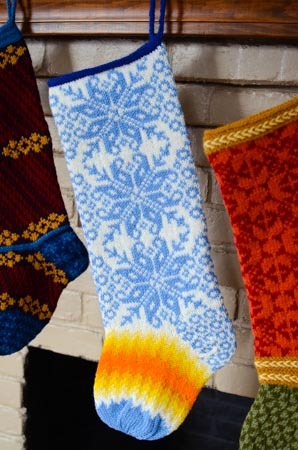 Pattern: Judy’s Colors, Fire and Ice Christmas stocking kit. Yarn: Raumagarn 3-ply wool yarn. Needles: US 4 Susan Bates 16″ circular needle and dpns. Happy Holidays, dear readers, and best wishes for 2014! Beautiful stockings! Love your blog I have been following it for years! Happy Holidays. That’s really lovely. Merry Christmas to you all! His stocking turned out great. Wishing you and yours a wonderful Holiday season! You’ve just made me feel better and given me hope that i’ll eventually get s something Christmas y for my own 6 month old son! they look great all hung together! 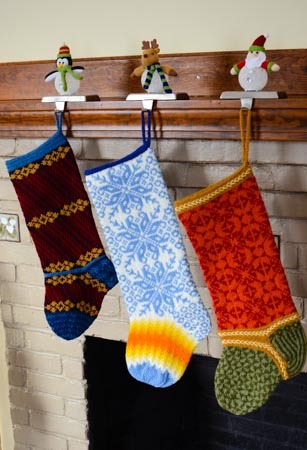 Love the stockings, and congrats on finishing Gregory’s before the holidays – quite a feat, in my book! I love it. Very festive with all three in a row. Love it. Happy holidays to you and your family! they are gorgeous! well done! Beautiful, all 3 of them!